Place the cashews in a bowl, and add enough water to cover by 1 inch. Let sit overnight. The next morning, drain the cashews and discard the soaking water. Place the cashews in a blender, add 3 cups water and the maple syrup, and blend until smooth. Combine 1 cup of this cashew milk with the chia seeds in a bowl, and let sit for about 20 minutes, until the chia seeds absorb the milk. The remaining cashew milk can be saved and refrigerated. 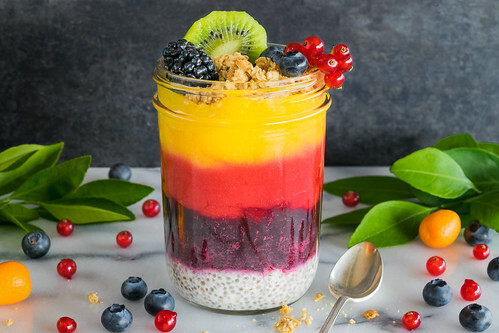 Place about 1/2 cup of chia pudding in a tall glass or jar. Spoon the blackberry purée over the pudding gently so they form 2 separate layers. Add the raspberry purée, then the mango puree, keeping the layers as distinct as possible. Top with half of the granola, and garnish with fruit as desired. Enjoy! — If desired, you can pass the raspberry and blackberry purees through a fine mesh strainer to remove the seeds, as pictured here.